Function is the basis of good design, especially in an area where you'll be working day after day. 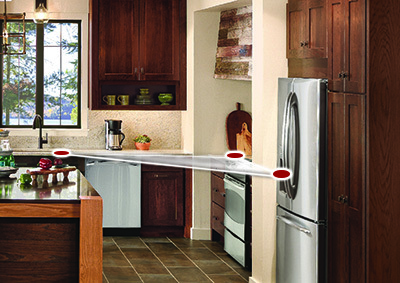 Our Start Your Floor Plan tool lets you build a kitchen around the work you'll be doing there. But to make your life easier and more enjoyable, you'll want to start out with a clear plan for your work triangle, because you can save yourself a lot of unnecessary movement-and time-over the years. Imagine a triangle that connects the three main places where you do three different tasks: cleanup, cooking, and food storage. 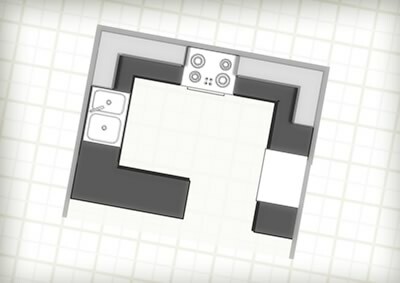 There are four main kitchen layouts: “L,” “Galley,” “U,” and “G” (Peninsula). Each accommodates a work triangle in its own way.